Cable Railing Systems by Stainless Cable & Railing Inc.
Below are products used specifically for stainless steel cable railing systems. 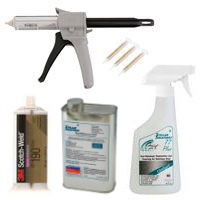 Epoxy is used to glue post caps, flanges, and other post and top rail components together without screws for a clean, strong finished frame. Passivation solution is used after installation to reinforce and replenish the passive layer of stainless steel, which allows it to properly resist corrosion and staining. Passivator should be reapplied periodically following installation to maintain this protection for years to come. We also recommend the use of Rust Rescue to prolong the effects of repassivation, particularly in environments prone to accelerated corrosion. "It looks great! The railing system is on a $3 Million home near the ski resorts..."
"I'm very pleased with the quality and strength. Everything fit and went together easily. I was very happy with the way your company takes the time to carefully wrap and pack the railing posts..."
Get a $25 Starbucks Gift Card by sending us a few large, high resolution photos of your finished SC&R railing. Copyright � 2018 Stainless Cable & Railing™. All Rights Reserved.